Looking for a Quick & Easy dinner you can whip together for your family on a busy weeknight? 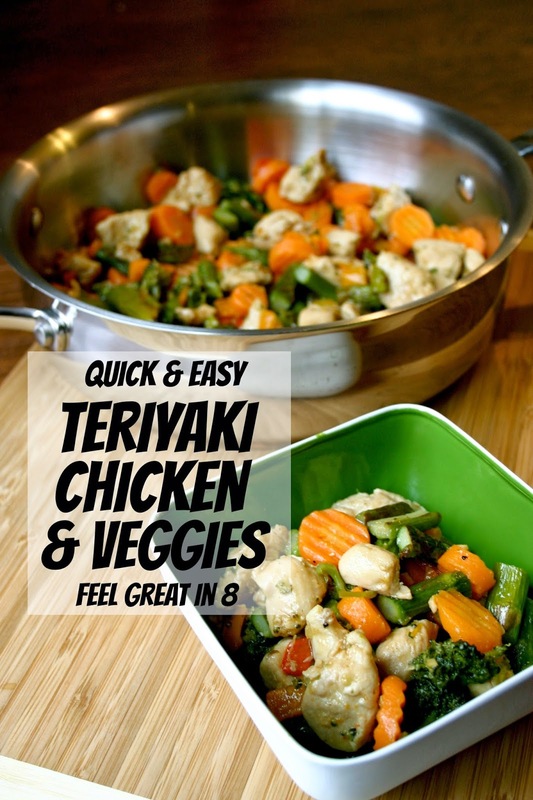 This Teriyaki Chicken & Veggies is the answer to what you’ve been looking for! As you’re reading this, I am far away from home and enjoying some much needed time with my wife, who has been away from home for the last eight weeks for Basic Military Training. Before I left though, I made sure to take care of things at home and hook you up with one of my favorite people on the internet. Tiffany, from the Feel Great in Eight Challenge, is such an inspiring person. She loves to help people get healthy and really focus on the important things in that journey, like how you FEEL, not necessarily the numbers. 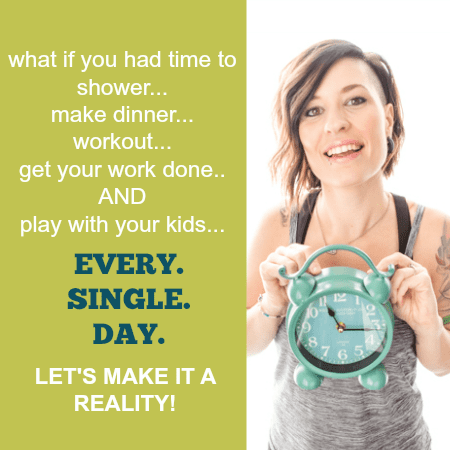 She even runs a Challenge each month to help you reach your goals! You’ve got to check it out! Today, Tiffany has stopped by to bring you this super easy meal that you can whip together in no-time. I love meals that look and taste like they took a long time to prep, but are really one of the quick and easy ones you turn to on an extra crazy day. This recipe is one of those. The homemade teriyaki sauce takes less than 10 minutes and tastes like it took hours. Just add chicken and any veggies you have on hand and you are done. I usually just grab whatever vegetables I have in the fridge or freezer. The whole thing can be thrown together in less than 30 minutes. Take that Rachel Ray! In the recipe I’ll list the vegetables I used the last time I made this dish, but you are welcome to use any vegetables you have on hand and cook them however is easiest. If you want super easy, you can even buy a large bag of frozen mixed vegetables in a microwave steamer bag. This time I threw some fresh broccoli into my steamer, microwaved a frozen bag of carrots, and threw some bell pepper in the skillet with the chicken. I also added some roasted garlic asparagus I had leftover in the fridge. I’m all about quick and easy. And as always, feel free to substitute in any vegetarian substitute, such as mushrooms or tofu, in place of the chicken. Mix all of the sauce ingredients in a small saucepan and cook over medium to low heat, stirring occasionally, until thickened (about 5 minutes). Heat the olive oil in a large sauté pan, over medium to high heat. Add the chicken and peppers and cook, stirring occasionally, until the chicken is cooked through (about 6-8 minutes). Add the garlic and cook for another minute. While the chicken is cooking, cook your other vegetables until crisp tender. They can be put in a microwave safe dish and microwaved for 6-7 minutes, roasted in the oven, or cooked in a steamer. 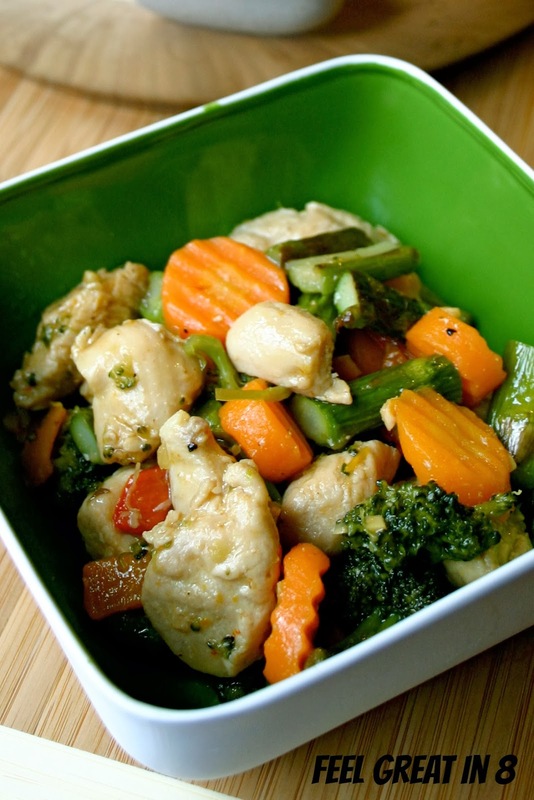 Stir together the teriyaki sauce, chicken and vegetables until everything is coated. Serve over whole grain brown rice or rice noodles.